What’s that between buildings that look like shuriken from above? Of course it is Lake Bill. It’s not marked on the map kindly made available by Jeff Barr, but there it is in an awesome 360 degree panorama and here are some pictures of ducks and koi that live there. There’s another picture in the blog post by Adam Barr (I’ve read his book) about 10 favorite spots on MS campus. 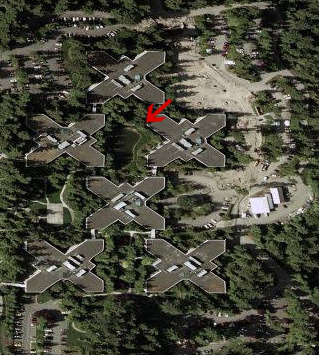 I am told that it is a prime beer drinking spot – no wonder seeing how many Barrs there are at Microsoft budum-pum. The origin of the naming of the lake is shrouded in mystery. I also heard that long before Bad Boy Ballmer was charging up developers by jumping on stage he was doing that by swimming across Lake Bill. By the way, does anyone have a video of Gates’ famous table jumping skills? Does he do that any more? Oh, and if somebody pointed me to those funny Microsoft Tech Ed videos, that would be very cool.